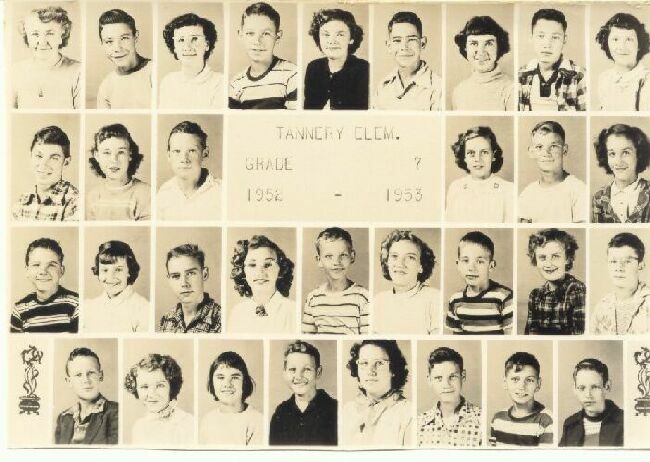 Tannery Grade School Seventh Grade,1952 - 1953! If anybody know of errors on the page, please let us know. 1952 - 1953 Tannery Grade School seventh grade class. You already have this on your web site but some names are missing. I am listing the names as I have them identified on my picture. I notice that a couple names do not match. Maybe someone else along the way can give more information. For old times sake I thought you guys might like to post the attached school picture from the Tannery 7th grade class. Elvin Hall and I took a shot at identifying each photograph and this is what we came up with; # 1 Miss Mary Lee Hollingsworth, teacher, # 2 Jimmy Weese, # 3 Donna Gay Downy, # 4 Bob Houghton, # 5 ?, # 6 Kieth Shelton, # 7 Jean Blake, # 8 Buddy Cummings, # 9 Janice Holliday, # 10 Gary Gordon, # 11 ?, # 12 Gerald Blose, #13 Gay Johnson, # 14 Elvin Hall, # 15 Judy Phillips, # 16 Kent Giles, # 17 Polly Weese, # 18 Howard Nailor, # 19 Barbara Peters, # 20 Ronnie Hartshorn (? ), # 21 Shirley Meadows, # 22 Dallas Dobson, #23 Linda Dobson, # 24 Paul Vitello, # 25 Steve Trescott, # 26 Nancy Hitt, # 27 ?, # 28 Lanty Lester, # 29 Katie Cutlip, # 30 Bobby Harvey, # 31 Billy Bobblet and #32 Johnny Frame. Most of these are correct but a few I'm not sure about. Maybe some of the old classmates can help us out. In the 1st row, name #9 was listed as "Janice Holliday" we de-listed Janice Holliday. The correct name is "Barbara Holliday". Thank you for your work in keeping "Old Richwood " alive.